Thanks for checking out this Nuke newsletter. This time, meet Daniela, Nuke Product Designer. Keep an eye out for details on Foundry's upcoming activities at FMX! Included from the Nuke 11.3, this example in the Python Dev Guide helps you explore connecting the Nuke Studio and Hiero API to your asset management system. Using a simple spreadsheet, the example shows how information such as renaming, comments, tasks, and timecodes can be passed between Nuke Studio and a database. From Nuke Studio you can update your project based on shot selections or the entire sequence at a click of a button. You can also import data from spreadsheets to completely build a new sequence directly within Nuke Studio, or submit your timeline for client review to quickly create rendered mov files, the file paths of which will automatically be updated into your spreadsheet. While several shot management tools including Shotgun and ftrack offer their own integration with the Hiero API, this example helps demonstrate some of what is possible with the API and may be a helpful starting point for building your own integration. Building on the improved selection tools released in Nuke 11.3, our team has been working on extending how you can select and modify objects in Nuke’s 3D space. You can now enable Soft Selection at the top of the viewer or with the N hotkey, and then select points or faces while capturing surrounding points within a certain threshold to create a natural selection falloff. You can utilize soft selection with the rectangle, elliptical or lasso selection tools, and it allows multiple selection areas with the use of the shift key. By hitting ‘S’ in the viewer to open the viewer properties and switching across to the 3D tab, you now have access to advanced soft selection controls, such as the ability to set the soft selection falloff radius, the falloff curve shape and the ability to define your own custom shapes. 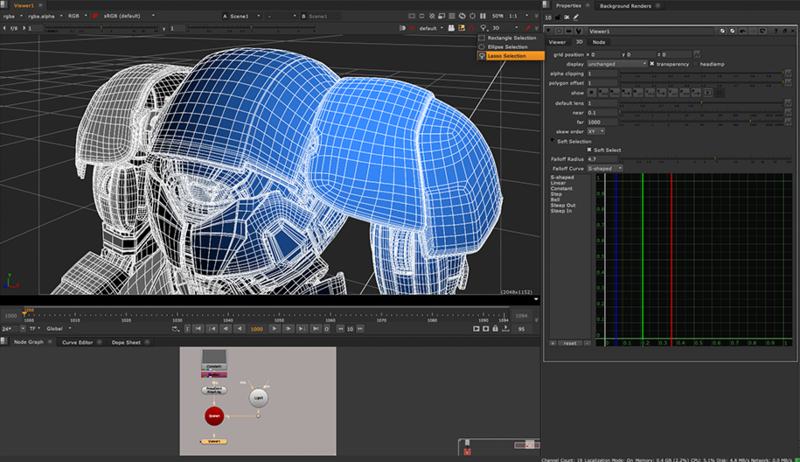 Alongside the NukeX EditGeo node, soft selection gives you greater control for modifying and editing geometry inside of Nuke’s 3D space. Keep an eye out for this in an upcoming release!